BLOOMINGTON, Ill.— Professor of Nursing Carolyn Jarvis has been elected Student Senate Professor of the Year by the Illinois Wesleyan student body. The Student Senate conducts the annual election as a way for students to show appreciation to faculty members. As Professor of the Year, Jarvis will address the Class of 2017 during Commencement on May 7. Jarvis joined the faculty at Illinois Wesleyan in 1990. She earned a Ph.D. in nursing from the University of Illinois at Chicago. An internationally recognized authority on health assessment, Jarvis is the author of North America’s most widely used health assessment textbook, Physical Examination and Health Assessment, now in its seventh edition. Her research interests have focused on the physiologic effect of alcohol on the cardiovascular system, and more recently, on learning Spanish in order to provide healthcare locally and in rural Guatemala. She is a member of Sigma Theta Tau, Illinois Nurses Association – 6th District, I.N.A. Council of Nurse Practitioners, American Association of Critical Care Nurses, and active in the Illinois Society for Advanced Practice Nursing. In the same election, students elected Warren Kistner, director of the Hart Career Center, as 2017 Staff Member of the Year. 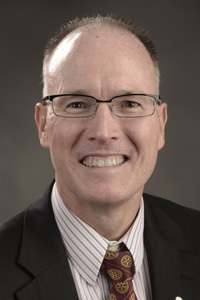 Kistner has worked at Illinois Wesleyan since 1995. His duties as Career Center director include career counseling, graduate school preparation, programming, employment development, alumni services and strategic planning. He is a 1983 graduate of Illinois Wesleyan with a major in business administration. 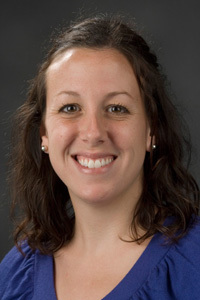 Kistner also earned a master’s in counseling at Illinois State University. For the second year, students also elected an Academic Advisor of the Year, with Chair and Associate Professor of Sociology Meghan Burke selected this year. Burke received a Ph.D. from Loyola University Chicago, and is the author of two books and several journal articles on her research areas of specialty: social theory and race. She was also selected as Student Senate Professor of the Year in 2013.